What is it about turtles that makes you love working at Mon Repos? I've been at Mon Repos coming up to 20 years and love working with the turtles as they're such peaceful and majestic ancient mariners that have been beaten all the dangers and made it to adulthood. Each time I see a 100kg loggerhead turtle drag herself across the beach to the dunes I get a thrill! It's a privilege to work with an endangered species and it's rewarding that our work has delivered some positive outcomes for the population. Seeing the little hatchlings emerging from their nests, watching the sand bubble as they start to push towards the surface and then seing them take their first journey across the beach is fun and awe-inspiring. What is your favourite time during turtle season? Nesting season, because I love seeing the adult turtles ashore, throwing sand as they dig their nest and then carving out the egg chamber with their hind flippers - I find this really connects people to the wonder of nature. What is the most important thing we can do to help save the turtles? Keep oceans clean, practise turtle-safe fishing and boating and most importantly make sure we keep nesting beaches dark - free from illumination by artificial lights as they disorient nesting mothers. 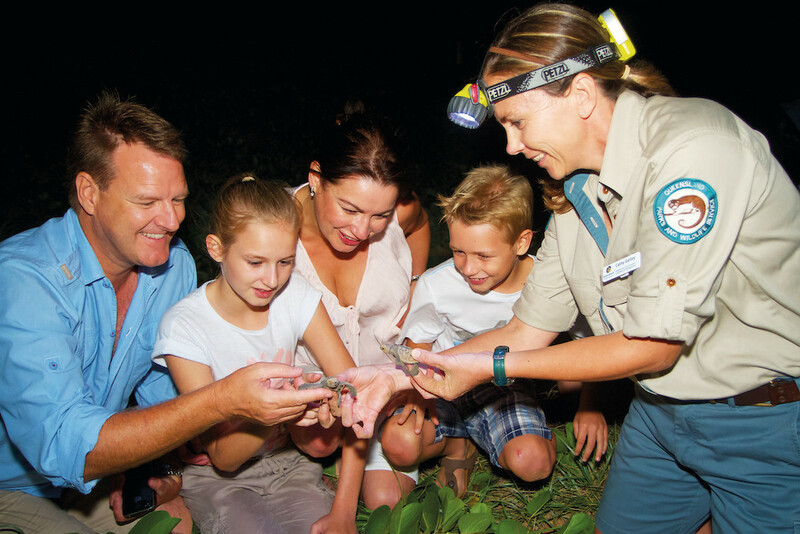 Your top tip for families coming to enjoy the Mon Repos Turtle Encounter? Pack your patience! Turtles operate on turtle time, which can be at any time during the night, so come prepared to wait, the encounter is well worth it. I would like to book the Mon Repos Turtle Encounter! I want to learn some turtle-y awesome facts!